If you’re a teen who is needing or expecting to get braces, you may have questions about treatment and how it is going to affect your appearance, habits, and activities. 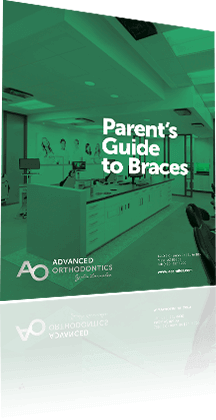 We’ve created this guide to answer some of the most frequently asked questions that we get from teens before, during and after their orthodontic treatment. Dr. Larrabee is an experienced orthodontist who genuinely cares about the comfort of his patients. The process of putting brackets on your teeth and the initial placement of your wires is generally painless. There are no shots or needles needed to place your brackets and wires. Many of our kids go back to school after getting their braces on. You may experience some discomfort in the day or two after you get your braces on and following adjustments. Many of our patients tell us that there is only mild discomfort and Tylenol is recommended to help with soreness. The length of your orthodontic treatment varies from patient to patient and is determined by the severity of the orthodontic issues. With the high tech self-ligating brackets Dr. Larrabee uses, treatment can be completed at a faster rate than traditional brackets with colored bands. How do I brush and floss with braces? When you have braces, it is important that you practice excellent oral hygiene by brushing and flossing regularly. Dr. Larrabee recommends brushing in the morning, after every meal, and before bed. Use a soft bristle toothbrush and carefully brush above and below each bracket and wire, paying careful attention to the gum line. As part of any oral health routine, you should be flossing daily. With braces, it is especially important that you floss because food can easily become trapped in your wires and brackets causing plaque to build up. When you get your braces on, Dr. Larrabee provides all of our patients with a take home brush kit. This includes, floss threaders to help you get the floss between your brackets and a proxy brush, a tool specifically made to help clean between your wires. If you want to have excellent oral health, you should consider using an antibacterial mouthwash. This will help to reduce any irritation of your gums and cheeks, while also keeping your teeth squeaky clean and your breath minty fresh! What sweets can I eat with braces? Don’t worry! You can still have all the creamy milk chocolate your heart desires with braces! You’re safe to indulge in soft sweets such as chocolate, cake, cookies and ice cream. However, you’ll want to avoid anything hard, crunchy or sticky-things like taffy, caramels, mints and anything that goes “crack!” when you bite into it. These foods have a high potential to bend or break your wires or pop off one of your brackets, leading to an extra trip to the orthodontist to have them fixed. One downside to braces is that there are going to be some foods that you simply should not eat. Anything hard, crunchy, or sticky needs to be avoided. Eating these foods can lead to a broken wire, a bracket or several popping off, or having food stuck in your braces. Examples of items that should be avoided include nuts, pizza crust, chips, raw vegetables, and chewing any non-food items such as pencils or fingernails. Yes! We highly recommend protecting your teeth with an orthodontic mouthguard if you play any type of contact sport. You can pick one of these up in our office at any time. Dr. Larrabee does not recommend using the at home, boil and mold mouthguards as these have a higher likelihood of causing damage to your appliances. The orthodontic mouthguard we are happy to provide you are specifically made to fit around and protect your brackets. Can I still play an instrument with braces? Many teenagers are involved in band and are worried that their braces are going to prevent them fro playing their instrument normally. This is a valid concern and we admit that there is a transitional period when you first get your braces put on. After a few days, you should be able to play your instrument as you did before and won’t even notice your braces. Am I going to need a retainer? After your braces are taken off, a retainer is vital to the success of your smile. The retainer works to keep your teeth from shifting once the braces are removed, help stabilize the teeth in the position they are in and is an essential part of your orthodontic treatment. Failing to wear your retainer as recommended can lead to unwanted shifting and relapse. See our retainer guide to answer all of your post orthodontic care questions! Will I need to have my teeth whitened? Whether or not you choose to whiten your teeth after getting your braces off is a personal decision. Some people find that following the removal of their braces there are spots left where the brackets were placed. This most commonly happens due to poor oral hygiene during treatment. Other patients want to show off their new smile and want the brightest, whitest teeth they can get. Dr. Larrabee is happy to discuss your whitening options with you following your orthodontic treatment. Yes! Invisalign is becoming a popular alternative to braces and is being requested more and more by our teenage patients. See our Invisalign Guide for Teens to get all of your questions answered and get some help talking with your parents about Invisalign Teen!